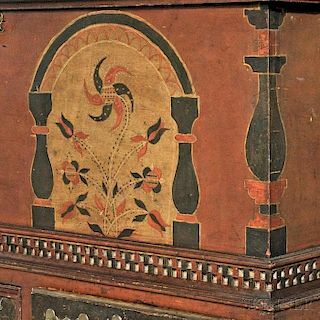 Bidders near and far will once again converge on Fairfield, Maine this month for James D. Julia’s Annual August Fine Art, Asian & Antiques sale. 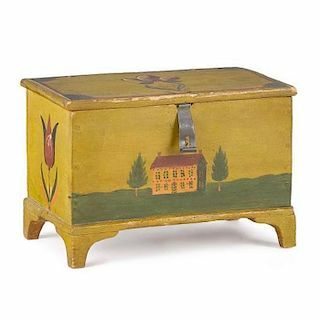 Running from Wednesday, August 24 to Friday, August 26, the sale features an astonishing selection of fine, decorative, and nautical art; antiques and Asian articles; historical items; and many remarkable, one-of-a-kind treasures. Good news for those unable to make it out to Maine - online bidding is available, look now at the full catalog! 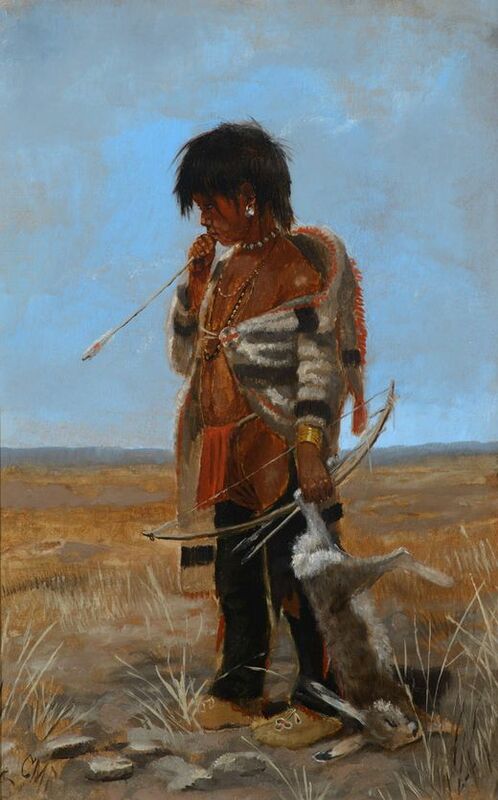 The sale’s selection of Rockport School paintings is always outstanding and this year features favorite Cape Ann artists including Gruppe, Glackens, Morrell and Gillette. 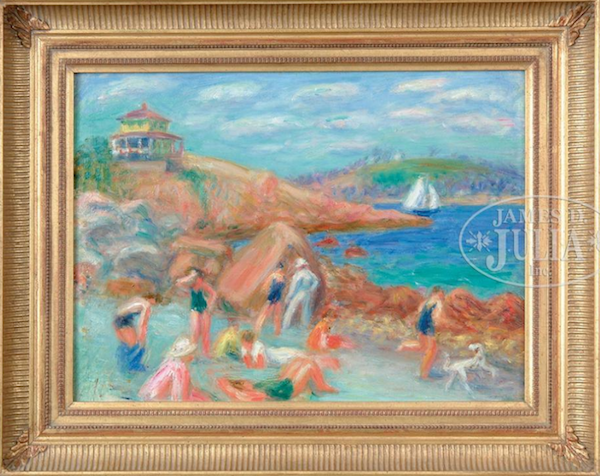 Lot 1120 (above), Rockport, Mass 1936 No.3 by William Glackens, comes accompanied by a letter from the artists son Ira, where he describes to a friend just how freezing the water was the day his father painted the picture. 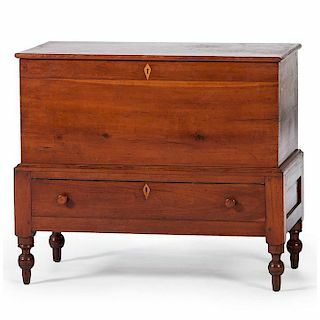 Quality antique furniture has always been a signature category for James D. Julia’s August sale. 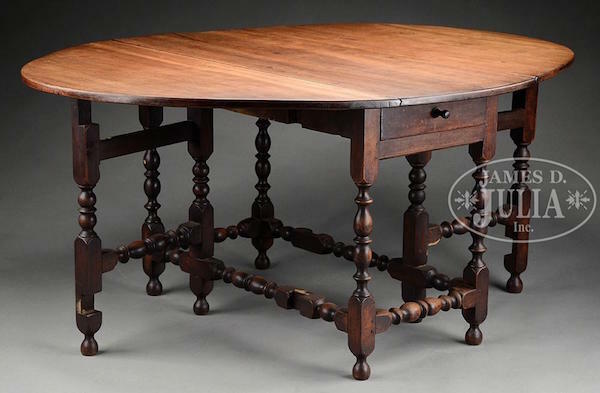 Highlights include Lot 2026 (above), a Boston William and Mary walnut gateleg table from the early 18th Century, originally owned by the Butler-Sigourney families of Boston and Oxford, MA. 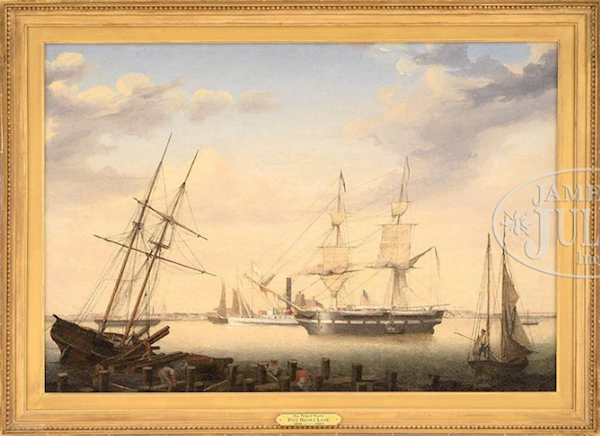 Paintings featuring seafaring vessels have traditionally made a huge splash in this sale. Heading the fleet will be Fitz Henry Lane’s New Bedford Harbor (above), an unsigned oil on canvas housed in a Eli Wilner & Co. frame. Other nautically themed highlights include James Buttersworth’s Yachting In New York Harbor, The Lofty Trader - The Scottish Moors Built 1890 by Montague Dawson, Robert Salmon’s Outward Bound, Long Island Head, Boston Harbor, and James Bard’s Portrait Of The Steamboat Daniel S. Miller On The Hudson River. Enthusiasts looking to add large, visually interesting treasures to their collections are sure to be satisfied. 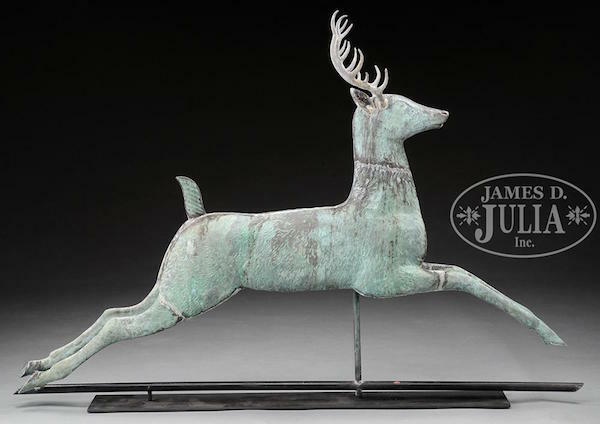 Among the highlights is Lot 2034 (above), a rare large leaping stag molded copper weathervane. Dating to the early 20th Century, this fine example with cast antlers and ears and molded tail is offered with museum stand. Day three features roughly 250 fine Asian items, including furniture, sculptures, paintings, jewelry, cloisonné, jades and porcelains. 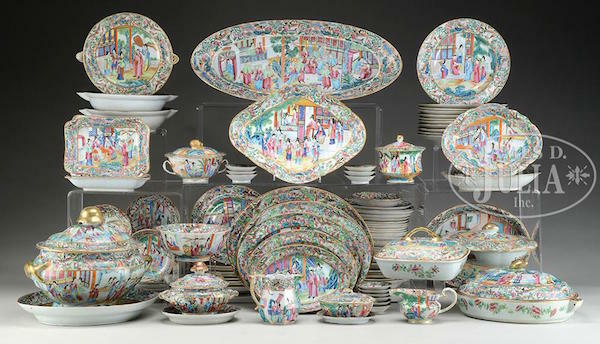 Lot 3637 (above), an impressive, 19th Century Chinese export Rose Mandarin dinner service in the “bird in the lantern” pattern, is sure to command attention. This lot includes traditional tableware plus matching platters, serving dishes, nesting bowls, tureens and other service items. View the full sale catalogs for Day 1, Day 2 and Day 3 now! Bidsquare Takes 3 Top Lots at Pook! 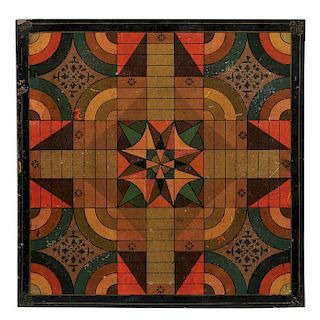 Game Boards Galore and More at Skinner!